Save time, save money, save manpower! The large, graphical touch screen display provides excellent visibility with a full QWERTY keyboard and numeric keypad for data input for unprecedented ease of use. Unleash the full potential of your ES601Plus with our ES601pc Companion Software. Simply install ES601pc and you’re ready to customize your ES601Plus to handle all your automated testing. 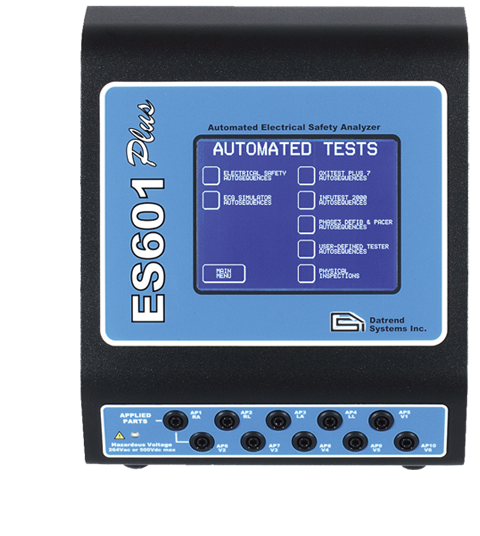 ES601pc comes standard with your safety analyzer and allows you to view and print test reports and to customize all aspects of test automation, including safety, ECG, tester and PM checklist procedures. Mains on Applied Parts voltage is 110% of AC supply for IEC60601 tests,or 100% of AC supply for other safety standards. 15 to 40 °C, 10% to 90% RH, Altitude: 2000m max.